It starts like any other day for Jess. Get up, draw on eyeliner, cover up tattoos, and head to school. But soon it's clear that this is no ordinary day, because Jess's best friend, Eden, isn't at school . . . she's gone missing.Jess knows she must do everything in her power to find Eden. Before the unthinkable happens.So Jess decides to retrace the life-changing summer she and Eden have just spent together. But looking back means digging up all their buried secrets, and she soon begins to question everything she thought the summer had been about, and everything she thought she knew about her best friend . . .A tense and moving journey through friendship, loss, betrayal, and self-discovery, Eden Summer, will plunge its way into your heart and stay there forever. 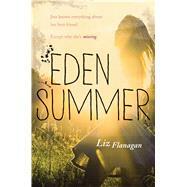 Eden Summer is Liz Flanagan's YA debut. Until recently, she ran Lumb Bank--the Ted Hughes Arvon Centre--supporting its famous writing courses. She previously worked as a commissioning editor in children's publishing. You can visit her online at www.lizflanagan.co.uk.